This very fine building sits at the top of London Road North in central Lowestoft. The Italianate tower and chromatic brickwork are reminiscent of the former Dereham Road Baptist Church in Norwich, although this is a better and more impressive building, I think. 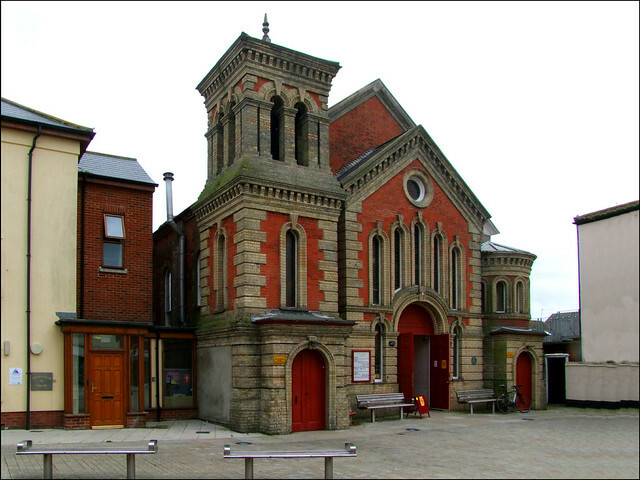 North Lowestoft URC began life as a congregational chapel, but it was built to replace a 1695 Presbyterian Church further up the High Street. 1695 was not long after the Act of Religious Toleration which allowed protestant communities to build their own churches, but when the Presbyterian minister left in 1815 the community reconstituted itself as an independent congregation. This fine replacement church was built in 1852. The Census of Religious Worship of the previous year gives us some idea of the success of the community, for although the old chapel had 250 paid-for sittings and just 80 free ones, there were on the morning of the census more than 300 people present, with another 240 coming along for the afternoon sermon. They must have been pressed for space. The new church of 1852 was larger, and aligned towards the east. A neat, pretty curved balcony cuts off all the windows halfway rather awkwardly, but must have always been intended. The walls are painted in the pastel shades familiar from non-conformist chapels elsewhere, but in a shade of restful pink which suggests, perhaps, a warm lack of fundamentalism here. Indeed, this was one of many congregational churches which became part of the new United Reformed Church in the early 1970s. A majority of 19th century churchgoers in East Anglia were non-conformists, but the gentle middle-of-the-road theology of the United Reformed Church, and that of its near-cousins the Methodists, seems to have suffered greater losses than most in the general polarisation of Christianity between Catholicism and more fundamental Protestantism in the second half of the 20th century. Now in East Anglia most non-conformists are Baptists, although it must be said that the Methodists appear to be holding on in Lowestoft. Here, the lady on duty told me, their congregation was ageing and in decline: "the only time the church is full now is when the other churches come here on the Good Friday walk", she observed, which seemed poignant, if not inappropriate.